This month’s Lyrid meteor shower isn't one of the year's strongest displays, and with Moon being in a thin, waxing crescent, it won't offer much competition. As with January’s Quadrantids, the Lyrids put on a fairly brief performance, and this year the predicted peak on April 22nd at 23:00 UT. The Lyrid meteors appear to radiate from a location near the Hercules-Lyra border, which is high in the sky from about 11 p.m. until dawn. The Lyrid meteor shower has been observed for more than 2,000 years; Chinese records say "stars fell like rain" during the shower of 687 BC. But in recent times, the Lyrids have generally been weak, though at intervals of about 12 years the shower occasionally delivers up to 10 times more meteors than normal. The Lyrids did show a brief surge to a Zenith Hourly Rate of 90 back in 1982, but a spike like that has not been reported in any of the Lyrid's since. 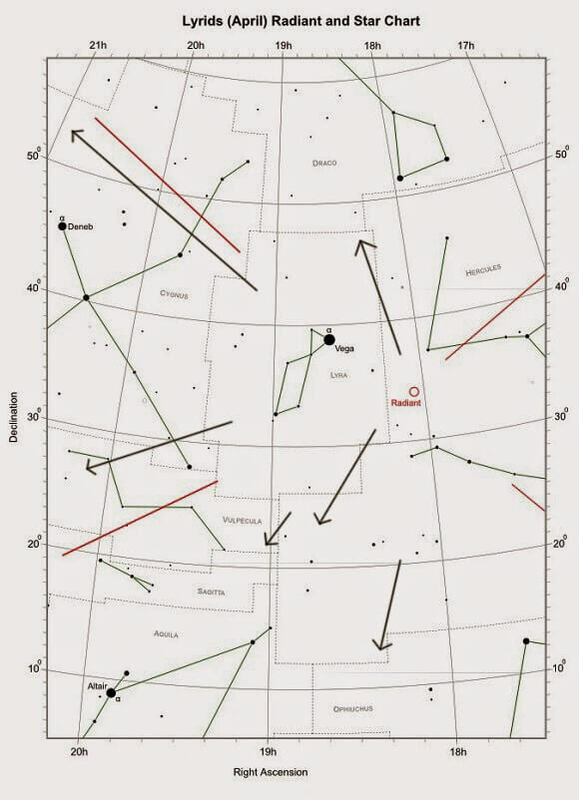 Visual Meteor Observing - An easy way to observe meteors visually is known as the "'counting method". An observer notes the meteors seen on a tape recorder or just a piece of paper. He or she gives the estimated magnitude of the meteor and whether or not it belonged to the observed shower (e.g. Lyrid or non-Lyrid). This method is most applicable for major showers like the Quadrantids, Perseids, and Geminids. 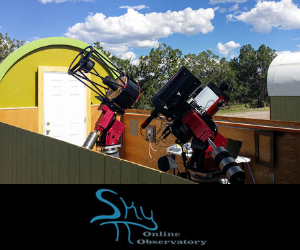 You have to decide which observing method, plotting or counting, can be used most favorably. 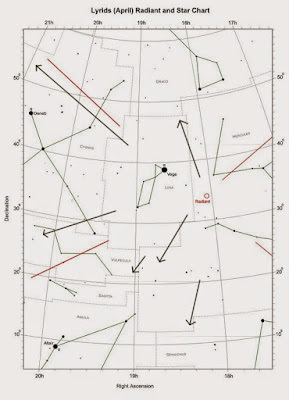 Personally, my preferred method of recording meteors is photocopying a page from a star atlas that includes the shower's radiant and when a meteor is spotted, I would then draw an arrow on the photocopied page of the star atlas pointing in the direction I saw the meteor moving in across the sky. The length of the arrow represented how far it traveled. Photographing Meteors - The first thing you have to have if you want to capture a meteor in a photograph is a camera capable of doing so. I realize there are still folks who use film cameras but the cost and effort of using film to shoot meteors is too great to include as a method, therefore, I will recommend just on digital. 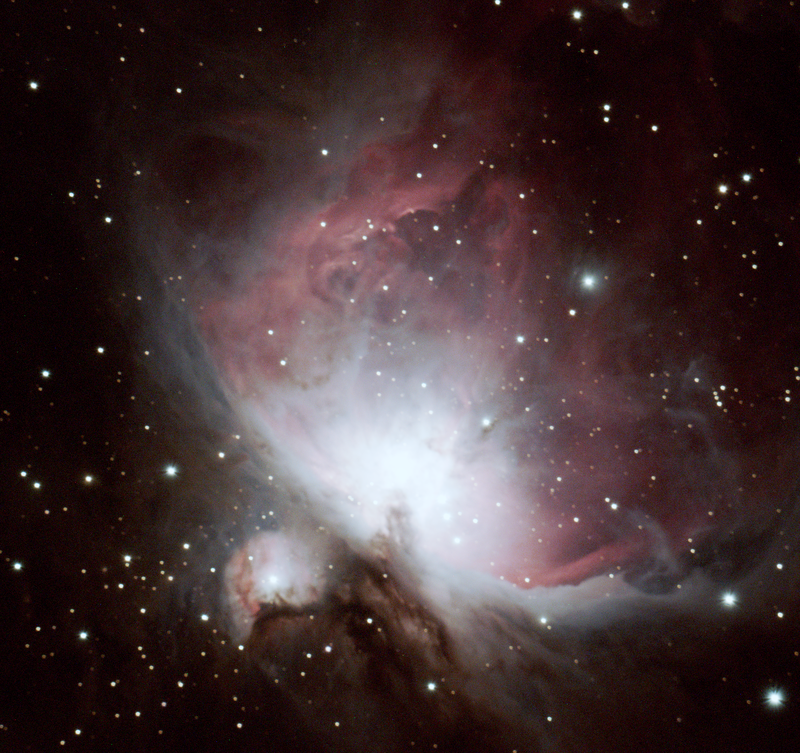 However, when I did use film years ago, I used a Pentax K1000 camera and use during meteor showers for long exposures. 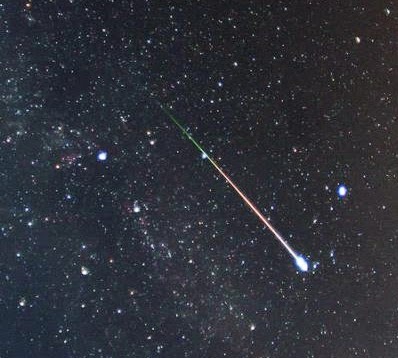 There are a lot of digital cameras out there capable of capturing excellent images of meteors. It is possible to catch a meteor on nearly any camera that allows for manual or semi-manual control and exposures of at least 15 seconds. Once you have your camera there are several other things you really need to have. 1. Sturdy tripod - No images shot during dark/dusk or in any low light condition will work without it. 2. Cable release - You don't want to be hovering over your camera all night with your finger pressed on the shutter and if you did your photographs wouldn't be as good as they could have been b/c you will cause a slight movement every time you touch the camera. Some cable release cords have settings that allow exposure length (bulb) to be specified which is a big help. 3. AC adapter or several batteries - Most digital SLR cameras have AC adapters available but if not several batteries should do the trick. 4. Memory cards - More than likely you will be taking lots of pictures in attempting to catch a meteor so make sure you have enough memory. An 8 GB card should be good for all night. A 4 GB card should work if your exposures are longer (1-2 mins). Another option is connecting your camera to a computer and controlling it via the computer and having the images saved directly to your computer. The down-side here is that a slight delay between shots (1-3 seconds) could cause the observer to miss something.